Frank YangUnderstatement? This has been a very fucked weekend in Toronto. From the moment it was announced late last year that downtown Toronto would host the G20 summit of world leaders this last weekend in June, it has been an inevitability that things would turn out this way – an overwhelming police presence on city streets to greet masses of protesters and demonstrators who acted as camouflage for small groups of so-called anarchists set on turning things violent and wreaking mayhem – all while the world leaders met behind massive fences, oblivious to the tumult outside, and ultimately accomplishing nothing besides agreeing to maybe talk further about the same issues the next time they got together. In other words, the exact same script that has played out at every one of these summits over the last ten years, and with people feigning surprise and outrage whenever any of the above occurs (although the complete lack of leadership and accountability from every level of government and authority this weekend felt new – maybe the Toronto summit decided to allow some ad-libbing?). Though out of town most of Saturday, I returned to find my neighbourhood had become a mess of smashed glass and boarded-up windows and though the flash points had moved elsewhere, the atmosphere was still extremely tense and discomfiting. Though staying home with the blinds drawn also seemed like a good course of action, a better option was available in heading out to Lee’s Palace where Ted Leo & The Pharmacists had the fortunate timing of playing that night. Or maybe unfortunate, considering that transit shutdowns and road closures made getting around the city difficult and the general advice seemed to be to stay home. Either way, the show was still on and while I might have otherwise liked a distraction from from everything going on in my city, I was curious to hear what Leo had to say. And get rocked. There wasn’t a need to wait for the headliner for that, though, thanks to tourmates Screaming Females. Their name was a bit of a misnomer as of the trio, only frontwoman Marissa Paternoster was lacking a Y-chromosome but they made up for that bit of false advertising by delivering on the screaming part. Not literally, as in lung-shredding hollers though there was a bit of that, but their combination of classic rock riffage and new wave stutter was pretty impressive and Paternoster’s intensely awkward stage presence kind of entertaining. Their audience wasn’t especially sizeable, but it was appreciative. “I know this is kind of a weird night”, Ted Leo said a little into their set, “but hopefully we can offer some catharsis”. This was as much comment on world politics as he offered at first, though he was more than willing to get into the state of the World Cup (sorry to see USA go but was fully behind Ghana). Instead, he let his set list do the talking – I don’t know what other cities had been getting, but for Toronto on this most particular of evenings, he and the Pharmacists delivered rocker after rocker, piledriving the fastest numbers and speeding up the others to terminal velocity, all delivered as such a punishing volume that Leo’s vocals were occasionally inaudible under the din. While he’s been touring as a four-piece for some time – they were still a power trio when I first started seeing them – this year’s Brutalist Bricks was the first written and recorded as such, and the new material which comprised the lion’s share of the set really benefitted from the extra complexity and power of James Canty’s second guitar. From the word go, there was no let up in the show’s energy save for when Leo stopped to converse with the crowd a bit, which had filled up nicely though not nearly to capacity, and crack a joke or two. It was during one of these breaks later on that he finally said he felt obliged to comment on the G20 happenings, and after a bit of back and forth with a patron who wanted more rock, less talk, he basically left it by saying that every one of the songs he would play this night was written in the past ten years and under the shadow of corporate globalization. And that’s probably all that needed to be said; anyone who’s listened to his music, which I think would be everyone there, would know where his ideology lies and implicitly what his stance would be on summits like this and the protests that’d ensue. I’m not sure what I had expected. Maybe some sort of explanation or rationale for what was happening in my city or why it was necessary – and to his credit Leo offered as such but warned it would take “like nine hours” – but that’s unfair. This wasn’t a lecture hall but a rock show – and not a Billy Bragg rock show – and on that count, Leo had more than delivered what was expected. An excuse to pogo during “Me & Mia”, a stellar solo cover of Nick Lowe’s “So It Goes”, a glorious “Timourous Me” and – after handing over his guitar to Canty who broke a string on his – closed the show out with a bloodletting (literally) “Ballad Of The Sin Eater”. Ted Leo has never put on a bad show, but this one reached a new level of intensity and yes, as promised, catharsis that I thank him for and hope is never necessary again. The National’s Matt Berninger tells Spinner about the time his luggage created a terrorist scare at an airport. Hi-larious. Pernice Brothers have released a blockbuster, high-budget video from Goodbye, Killer. He’s taking over the editorial reins at Magnet this week, and they kick it off with a Q&A. Daytrotter has posted a session with Venice Is Sinking. David Dondero has set a July 23 at the Drake Underground in support of his new record Zero With A Bullet, due out August 3. Nada Surf has recorded a video session for They Shoot Music. Of Montreal’s new record False Priest will be out September 14, and the first MP3 is now available to download. PitchforkTV serves up a TunnelVision session with The Depreciation Guild. The Quietus has an exit interview with James Murphy of LCD Soundsystem. And if this past weekend has utterly drained you as well, stock up on some good karma by chipping in and helping this puppy frolic again. Paper Bag RecordsWatching the video for Cyndi Lauper’s theme song for the classic ’80s kid’s film The Goonies is like a time warp in so many ways. Beyond the obvious trip back to 1985 – the film celebrated its 25th anniversary this year – there’s the whole “event”-ness of the vid: the massive, ’80s WWF wrestler cast, the appearance of most of the cast of the film not to mention also featuring director Richard Donner behind the camera, the fact that it was split into two parts – the first part debuting on MTV prior to the film’s release and the second part debuting after it opened… I only remembered vague bits of this – the Wikipedia entry for the song and video is quite thorough. And the thing that tends to get lost in all of this is that the tune underpinning it all – “Good Enough” – is really great, even when or especially when shed of all the circus-ness around it, it’s still a perfectly crafted pop song with a really sad heart – a shame that Lauper pretty much disowned the song for so long, though she’s begun re-introducing it to her live shows. The Acorn’s Rolf Klausener saw this, and he and his Ottawan cohorts recorded an interpretation of the song a couple years ago for inclusion on their Heron Act odds and sods compilation. Their version takes the downer vibe that exists in the song’s lyrics and brings it to the fore in spare and sombre form. A video with wrestlers would probably be wholly inappropriate. Well, The Rock might be able to pull it off. Dude’s got serious dramatic chops. The Acorn released their new record No Ghost at the start of this month and have already scheduled two tours around Canada and the US for this Summer and Fall to support – no Toronto date to follow their appearance at Lee’s Palace a couple weeks ago, but something in November seems reasonable. Cyndi Lauper is one of the marquee performers at this year’s Pride Toronto, giving a free show at Queen’s Park on July 3. Frank YangSo The Flaming Lips; they’ve kind of been doing the same thing live for pretty much forever, right? The bubble walk, the costumed dancers, the confetti canons, the general technicolour mayhem with Wayne Coyne as master of ceremonies – that’s been going on since at least 2006, circa At War With The Mystics, and I wouldn’t be surprised if a lot of it went back as far as the dates supporting 2002’s Yoshimi. Most entertainers who put together a high-production value show feel the need to reinvent it or at least change it up between tours, but the Lips – they’ll maybe switch up some giant rubber hands for a bizarro megaphone contraption, or trade Coyne’s relatively conventional double-neck SG for a Frankenstein one that’s half Guitar Hero controller. But even if it is all, technically, a bit predictable, the joy of a live Lips show is that no matter how much you think you’ve seen it all before, when you actually witness it all for either the first or the fifteenth time, you can’t help but be awed by the sheer ridiculous wonder of it all. And those of us in Toronto, at least, can hardly say, “what, these guys again?” because they haven’t been here since September 2006 – their famously abbreviated V Fest set – and before that, their last visit was in the Spring of that year at the Phoenix, a venue good for saying you saw them in an intimate club but not so good for things like walking on top of the audience in giant plastic hamster balls. Which is why their upcoming July 8 show at the Molson Amphitheatre is worth getting genuinely excited about. Not only are they playing a venue large enough for them unleash the full Flaming Lips live experience, but they’re (presumably) being given a long enough set time that there’s no chance of the authorities bringing the curtain down prematurely. 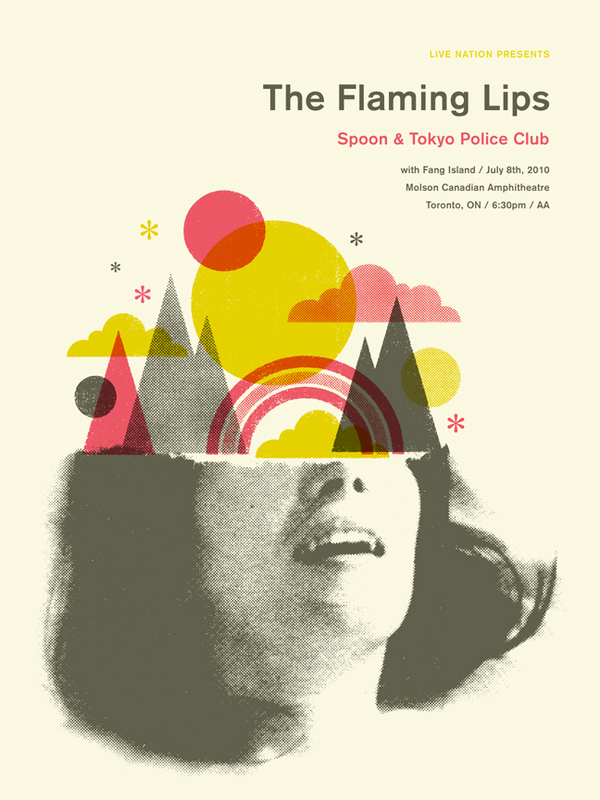 AND they’ve assembled a terrific string of support acts – Spoon, Tokyo Police Club and Fang Island – for what could well be one of the best shows of the Summer. Tickets range from $33.25 to $56.25, but courtesy of LiveNation, I’ve got two prize packs consisting of a pair of tickets to the show AND a lovely limited edition concert poster to give away. To enter, email me at contests AT chromewaves.net with “I want to see The Flaming Lips” in the subject line and your full name and mailing address in the body, and get that in to me before midnight, July 4. The AV Club, BBC6 and Spinner all talk to Wayne Coyne about stuff.